Arsenal head coach Unai Emery promoted Nigeria-eligible goalkeeper Arthur Okonkwo to first-team training ahead of their Premier League meeting with Watford at Vicarage Road Stadium on Monday evening. The England youth international was photographed training with the likes of Alex Iwobi, Pierre-Emerick Aubameyang and Granit Xhaka at London Colney on Sunday. With first-choice goalkeeper Bernd Leno and his current deputy Petr Čech attending the workout, Okonkwo's chances of being included in the matchday 18 are very slim. 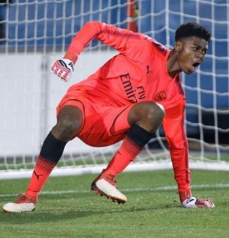 The young goalkeeper has not traveled with the Arsenal squad to the United States for the Dr Pepper Dallas Cup which got underway Sunday and could be in between the pipes when the U23s face Chelsea tonight at Stamford Bridge.